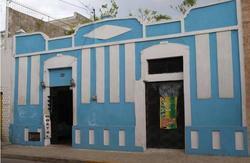 Hostal Zocalo is located on the main plaza in the laid-back colonial capital of the tranquil Yucatan State. Hostal Zocalo exudes a quiet elegance in which budget travelers can kick back and relax after spending full days roaming around ancient Mayan cities, swimming in spectacular natural wells (cenotes), and marveling in the diverse cultures and colorful fauna and flora of the Yucatan peninsula. Hostal Zocalo is a hostal with the feel of a guesthouse! We welcome people of all stripes and ages - from the young backpackers to grad school researchers to young families to professionals to 60-year-olds trekking their way around the world. The kitchen is the heart of this lovely house. People gather at the kitchen table for dining, music, and general good cheer both day and night. Additional spaces to enjoy, include a 25 meter long hall, or pasillo, and the lower deck garden. Breakfast, WiFi, purified drinking water, linens and towels are included free. A fully equipped kitchen is at your disposal. And, if you are traveling without your computer, there is an internet cafe downstairs and a couple of computers available for your use in the reception area as well. We are recommended by Lonely Planet, Routard and Reise Know-How. Check out Hostal Zocalo Facebook and 'Wireman's Hostal Zocalo' video at youtube.com. Downtown, directly on the Main Plaza. Tell the taxi driver that we are next to Casa Montejo, a well known landmark in Merida. Our address is Calle 63 #508.